For insects of the US & Canada, BugGuide is probably the most comprehensive site there is. Have you seen the following book? - https://shop.bugsincyberspace.com/Dung-Beetle-Pet-Book-bic18.htm Bugs in Cyberspace also has Phanaeus dung beetles available right now, in case you're interested. So far as US dung beetles go, Phanaeus are by far the most brilliantly coloured. And large, too. It's a 3rd instar larva of the Green June Beetle (Cotinis nitida) - https://bugguide.net/node/view/520 They normally live underground, but can occasionally be seen roaming around on the surface for various reasons, such as when the ground becomes too saturated with moisture after rain, or, if they are seeking the right kind of soil in order to construct a cocoon in which to pupate. In the case of this species, sandy / clayey soil is what they use to build their cocoons. A captive-bred, Blue-legged Jewel Scarab (Chrysina woodi) that emerged several days ago - the first live example of the species that I've ever seen in person. This species is from the mountains of far West TX. I didn't expect that I would have any adults emerging this soon - was thinking that they would probably wait until perhaps July / August. Quite different looking from C. beyeri - it has its own distinct shade of iridescent green, and a different color scheme, with its bright gold legs and metallic blue tarsi. There is also a band of gold along the margins of the elytra. Its natural host tree is a species of wild black walnut (Juglans microcarpa). Shorter-lived than most rhino and stag beetles, yes - but I've actually been quite surprised at how long I've had Chrysina adults live; up to 9 weeks in some cases (for captive-bred gloriosa, at least). I've also had some beyeri live for quite a while. More typically though, 6 to 8 weeks. But, that's more than enough time for them to lay plenty of eggs, and fortunately, even one Chrysina female can lay many eggs. Like most beetles of the desert southwest, the life cycle of Chrysina is strongly tied to the summer monsoon season. In captivity however, they often emerge out of sync with that, since I keep them under rather constant environmental conditions that don't include seasonal temperature and moisture changes. Typically, I keep them between 68 (winter) and 76 F (summer). Probably more important than the temperature though, are the substrate conditions needed for successful pupation. Thanks again for the speedy responses! His pupa is at the poin when the eyes and mouthparts are dark amd I can see his limbs under the shell if i shine a light. I can also just barely make out his top horn from above below the pupal skin. If that's the case, he may be only a matter of hours away from eclosion. Ah, thanks! So hibernation isn’t necessary for them to lay eggs, got it. However, I have 3 other male larvae that are nowhere near pupating and 1 male pupa that should emerge in a few weeks, should I hibernate he female just so that the others can catch up? Thanks! If you have a male that's still several weeks from eclosion, keep in mind that it's likely to be a couple of months (at minimum) before he actually emerges from his cell, and becomes active and ready to mate. Although tityus females can live for months, they should be mated within 60 days of becoming active, and ideally, within the first several weeks after they emerge from their cells. So, yes, if you can get the female to hibernate until you have a male become active, that would be best. If your males are all likely to emerge too late to mate with the female, you might check with bugsincyberspace to see if they have any adult males in stock. Also, do the pupal chambers need to stored horizontally or vertically for the adults to properly emerge? Thanks once again! They should be kept in the original orientation in which they were built by the larvae. Many beetles construct their pupal cells at an incline that puts the head end somewhat higher than the abdomen, and even if the incline is rather subtle, it's important to maintain this if the cells are moved. I've been keeping a continuous culture of tityus for at least 15 years, and have never hibernated them. I keep them between 70-77 F. year-round. They're now completely out of sync with the emergence time of the wild population, and it's not unusual for them to emerge and breed right in the middle of winter. If the beetles are active and feeding, they're ready to breed, regardless of the time of year. Incidentally, in Florida (peninsular FL, at least), tityus doesn't hibernate, since the climate is mild year-round. This is also why bears in zoos don't hibernate - it's simply not necessary. Hibernation is just a way to conserve energy during times when the weather isn't ideal, and food would be scarce. If an animal doesn't need to hibernate, it won't. I don't know about the commercial availability of such, but you should be able to collect a suitable type of "clayey" soil in virtually any part of the US, and so long as it's very fine-grained, and can be made somewhat sticky with right amount of water, it should work fine. The ultisols common to the southeast (which are typically red or yellow due to various concentrations of iron oxides) work well, but any soil type that has a high percentage of clay should be ok. I use some locally-collected, reddish-brown clay soil which I suspect is probably a vertisol. I believe it's not so much the pH of the soil that matters, but the texture and how "sticky" and easily workable it is by the larvae. From what I've heard, elaphus doesn't typically deposit eggs directly into wood, but instead lays them in the soil right next to suitable wood, which the larvae then chew into. To make matters more complicated, it apparently also needs to be soil of a certain type and consistency (clayey, I believe). 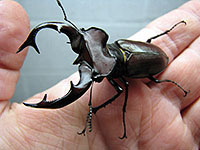 A recent study on Lucanus cervus in Britain revealed that the distribution of this species correlates directly with the distribution of a particular soil type, rather than the beetle's host trees. Even if there are TONS of dead, rotten oaks in an area, the beetles will be absent if the local soil is of the wrong type. ...I would have severe concerns about the safety of heating even wet sawdust to 240F using any commonly available method for any considerable length of time. Seconded! My advice - stick to time-tested fermentation methods that are known to work well and safely. Incidentally, wood can start to char at as little as 180 C. I'm sure that wetness vs. dryness is a factor, but even if the material is wet when the heating process starts, it might not uniformly remain wet enough to prevent the possibility of ignition. And, it's not just the potential for fire that's a threat - carbon monoxide can be produced too, if combustion starts. Yes, that should be perfect. I've had thula adults live for at least 8 months, and they can remain fertile for quite a long time. In the 15 or so years that I've been keeping this species, I don't think I've ever actually seen a single mating! Obviously though, it must happen, as you just keep the beetles together on a suitable breeding substrate, and after a while (usually less than a month) you'll suddenly start to see tiny larvae appearing. Several weeks after that, there can be hundreds! If your substrate is of good nutritional quality, they'll grow quite fast. The larvae also like apple slices, though they might not take much interest in it until they get into the late L2 stage. I assume that the container with the cocoon must be ventilated somehow? I can't tell from the photo, but undoubtedly, there are some ventilation holes? Is the cocoon normally kept on the substrate surface like that, throughout the pupation process? I am in agreement with all of these comments. Yes, it's quite possible that granti and tityus diverged considerably less than 2 mya. They might not have appeared as distinct "species" until sometime well into the Pleistocene, possibly even the latter part of the epoch.